Today at the Sakya Centre Bristol, Paul Rogers from Sakya Namgyal Ling in Exeter, was invited to lead a day of contemplations and meditations on the Zhenpa Zhidral (Parting from the Four Attachments) by Jetsun Dragpa Gyaltsen. The day was presented in four one-hour sessions, and Paul clarified the meaning of the pithy verses in a comprehensible relaxed style. 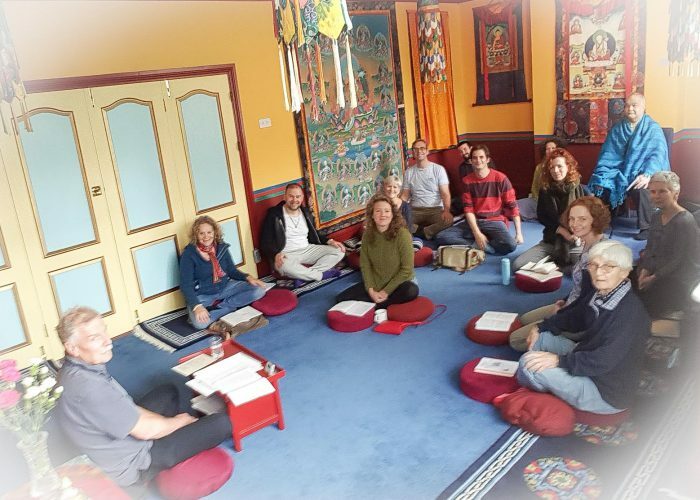 The day was attended by 16 people, some of whom had only recently taken refuge, and were therefore able to discover the richness of this important Sakya “Mind Training” text for the first time. Jetsun Dragpa Gyaltsen’s text alludes to many of the teachings covered in the weekly classes but particularly highlights how easily our motivations for practicing can be subverted by self-interest. A lovely day was had by all and we look forward to Paul’s visit next Year!